ABC NEWS, ALTERNET, ANCHOR BABIES, AUSTIN, BALTIMORE, BUZZFEED, CBS NEWS, CHICAGO, CNN, DAILY KOS, DALLAS, DEMOCRATIC PARTY, DENVER, DEPARTMENT OF HOMELAND SECURITY, DETROIT, DONALD TRUMP, ENGLISH AS A SECOND LANGUAGE, FACEBOOK, HISPANICS, HOUSTON, ILLEGAL ALIENS, illegal immigration, JERSEY CITY, LOS ANGELES, MEXICAN WALL, MEXICO, MIAMI, MINNEAPOLIS, MOTHER JONES, MOVEON, MSNBC, NANCY PELOSI, NBC NEWS, NEW HAVEN, NEW YORK CITY, NEWSWEEK, NPR, PHOENIX, POLITICO, PORTLAND, RAW STORY, REPUBLICAN PARTY, SALON, SALT LAKE CITY, SAN DIEGO, SAN FRANCISCO, SANTA ANA, SEATTLE, SLATE, THE CHICAGO SUN-TIMES, THE CHICAGO TRIBUNE, THE DAILY BEAST, THE HUFFINGTON POST, THE LOS ANGELES TIMES, THE NEW YORK TIMES, THE WALL STREET JOURNAL, THE WASHINGTON POST, TIME, TWITTER, U.S. NEWS & WORLD REPORT, USA TODAY, WASHINGTON D.C.
President Donald J. Trump is vigorously pursuing his own solution to illegal immigration: A massive, impenetrable wall along the U.S.-Mexican border. And Democrats in the House of Representatives are just as vigorously rejecting it. So Trump is raising the stakes—and threatening to send countless numbers of illegal aliens to “sanctuary cities” that defy United States immigration laws. Among those 31 “sanctuary cities”: Washington, D.C.; New York City; Los Angeles; Chicago; San Francisco; Santa Ana; San Diego; Salt Lake City; Phoenix; Dallas; Houston; Austin; Detroit; Jersey City; Minneapolis; Miami; Denver; Baltimore; Seattle; Portland, Oregon; New Haven, Connecticut; and Portland, Maine. These cities have adopted “sanctuary” ordinances that forbid municipal funds or resources to be used to enforce Federal immigration laws. This usually means forbidding police or municipal employees to inquire about people’s immigration status. One of the cities Trump intends to target is San Francisco—the district of Democratic House Speaker Nancy Pelosi. 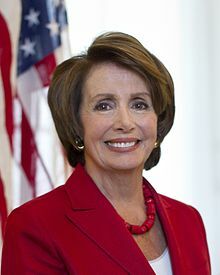 Undoubtedly Pelosi realizes the anger she would face among her constituents if they found themselves flooded by tens of thousands of illegal aliens making demands on already stretched housing, schools and hospitals. Since these aliens come from Central America, Spanish—not English—is their only language. Which means their children would have to be given costly ESL assistance throughout their schooling. The White House and Department of Homeland Security claimed that the proposal was no longer being considered. Trump never held public office before reaching the White House. But, as a businessman, he well knows how to appeal to people’s greed and selfishness. By flooding “sanctuary cities” with tens of thousands of illegal aliens, Trump will quickly drive a wedge between ardent liberals such as Nancy Pelosi and their constituents. In short: The beautiful “every-man-is-my-brother” theories of liberal politicians are about to slam head-on into the ugliness of real-world needs and wants. This is, in fact, now taking place in Tijuana, Mexico. In November, 2018, Trump deployed the United States military and closed the U.S.-Mexico border to prevent a 5,000-member Central American caravan from entering the country. By November 19, migrants had begun piling up in Tijuana, which borders San Diego. Suddenly, Tijuana became increasingly overcrowded. And its residents began carrying signs reading “No illegals,” “No to the invasion” and “Mexico First.” And marching in the streets wearing Mexico’s red, white and green national soccer jersey and vigorously waving Mexican flags. When legal citizens—whether Mexican or American—can’t obtain the government services they have been used to getting, they quickly become enraged. At first, many—perhaps most—of those living in “sanctuary cities” will vigorously support their elected officials in refusing to knuckle under. But as time passes, public needs will go unmet while local monies become increasingly strained. First, legal citizens will rage at the local officials of these cities responsible for “sanctuary” policies. Then they will focus their anger on the illegal aliens being protected by those civic officials. They will increasingly demand that their elected officials to cooperate with Federal immigration agents. Some citizens will almost certainly take out their anger on anyone who even looks Hispanic, let alone speaks only Spanish. And those citizens who feel conscience-torn by demanding an end to “sanctuary cities” will console themselves with this literal truth: Illegal immigration is against the law—and local officials have a sworn duty to obey the law at all levels—including those laws they don’t agree with. Steffen White’s Email: Former reporter, legal investigator and troubleshooter. Columnist at Bureaucracybuster.com: Fighting political and bureaucratic arrogance, incompetence and/or indifference. McBride & Associates Investigative Services Providing timely, accurate and confidential information to the Legal, Financial and Business communities. When making complaints in writing, carefully review your email or letter before sending it. Remove any words that are vulgar or profane. Don't make sweeping accusations: "Your agency is a waste." Don't attribute motives to people you've had problems with, such as: "The postal clerk refused to help me because he's a drunk." If the person actually appeared to be drunk, then be precise in your description: "As he leaned over the counter I could smell beer on his breath. Behind him, in a waste basket, I saw an empty bottle of Coors beer." Show how the failure of the official to address your problem reflects badly on the company or agency: "This is not the level of service your ads would lead potential customers to expect." If necessary, note any regulatory agencies that can make life rough for the company or agency if your complaint isn't resolved. For the phone company, for example, cite the FCC or the PUC. But do this only after you have stated you hope your complaint can be settled amicably and privately within the company.